We all know who the recycling champions are. That one person who takes up the charge on his or her own. Often quietly, often without recognition, they nudge the rest of us to drop the cans and bottles in the correct recycling bin, and to gently remind us not to use what we don’t need. They are the self-appointed champions of recycling and zero waste in our offices, schools, homes and apartment buildings. (Often times they are us!) I think they all deserve a medal! One such deserved recycling fellow came to my attention recently during a presentation that WeHateToWaste founder Jacquie Ottman made at the Schwab House, a large apartment building on NYC’s Upper West Side. Rick Schulman serves as chair of the Schwab House Environmental Committee (SHEC), a post he expanded from the energy-only function in 2012. It has become a platform for an impressive number of contributions, just starting with recycling. Rick has helped Schwab House become one of the first buildings to take advantage of New York City’s program for convenient in-building pickups of recyclables including food scraps, clothing and textiles, and e-waste. Pictured below, he has also installed collection bins he made himself for eyeglasses, corks, Brita filters, batteries, plastic bags, and small electronics. These recycling bins, created by Rick Schulman of NYC’s Schwab House for sorting eyeglasses, corks and other recyclables help his Upper West Side building achieve zero waste. Knowing it takes more than just making it easy to sort recyclables, Rick has organized a series of guest lectures, film screenings, and fields trips to get fellow residents of Schwab House informed on issues like climate change and waste reduction. Every Earth Day, he sits at a table in his lobby to make residents aware of how the Schwab House can improve its carbon footprint. Rick has also put external green causes on residents’ radar screens. Thanks to Rick’s efforts, residents now have access to CSAs (community-supported agriculture) to support local NYC region farmers, sign petitions to support NYC’s new plastic bag fee, donate coats to NYC Cares coat drive, donate handmade blankets to the needy, ship used eyeglasses to those in need overseas, and help feed NYC’s homeless. Outside of his activities for the Schwab House, Rick is a “Partner in Conservation” with the World Wildlife Fund. 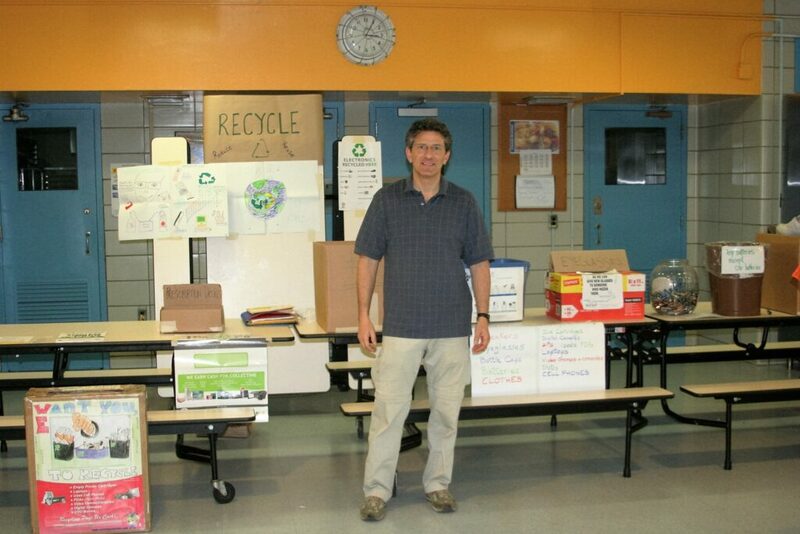 He has also served as a member of the PS 199 Healthy Child / Healthy Planet Committee. The Committee received the NYC Department of Sanitation’s Golden Apple Award twice for their work improving awareness and reducing waste at school. 1. Maint ain Commitment: Having meetings every month and showing up with an agenda and ideas even when only a handful of residents in the building attend can be challenging. Sending out the minutes, writing a column for our in-house Newsletter and sending out emails and notes via our intranet regarding local events, suggestions and guidance is time consuming, but worthwhile. 2. Persevere Despite Pushback: We have a very strict Board of Directors in our Schwab House co-op, and in order to get anything approved with a majority vote, one is on pins and needles. Often there are strategies, alliances and specific wording that are necessary for progressive projects to get the go ahead. Planning and tenacity are key in trying to push through the projects I have initiated! Also, a tough skin is necessary at times. Sitting in the Schwab House lobby sharing how to properly compost, many residents were thrilled and thankful that I worked to bring this program to our building. However, there were those who said basically, “I don’t believe in that…it is too burdensome for my life style.” It takes a lot of patience and humility to get past my frustration in hearing that type of attitude and to move on for what I believe is the greater good. 3. Be Creative and Open Minded: I cooperate with the Schwab House building’s Parents Association, our Political Committee, and our Gardening Committee. I try to think of ideas where not only adults with various interests, but children as well can learn about the environment. 4. Stay on Good Terms with the Building Staff: Not only the board and management are important to getting these things done. The building staff is vital to actually putting these initiatives into action. If the building porters don’t respect our Recycling stations, our Wearable Collections bin and lending library then they will get destroyed and get hidden from residents. I do my part every week to maintain these collections, and the staff sees me putting my sweat into it. In turn, they are willing to help me when I need it. 5. 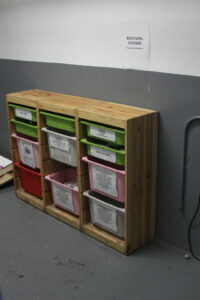 Keep the Cost Low and Demonstrate Support: In my proposal for recycling stations I kept the cost minimal and purchased inexpensive items from Ikea that I built myself. I recruited a base group of dedicated Schwab House residents to help me with compliance of continuing to channel items to the proper places. (We bring plastic bags to local stores, and ship out corks, Britas, eyeglasses and small electronics when sufficient supply amasses, etc.) This way the board doesn’t really have a case to turn you down. 6. Remember, It Takes a Team: The Schwab House Environmental Committee has been a springboard for many of the environmental changes in the building, but it truly takes a team and support from management and the board to make change happen. Rick knows what motivates him, “I do what I think is right for the environment and the kudos comes later, often unexpectedly. I get thanks from neighbors whom I never met before when they find out who I am. They say that they have changed their habits and they often keep my columns for future reference. That is very gratifying. Rick’s work is inspiring, and we believe that there are waste warriors like him all over New York City and the world who deserve recognition. Efforts like theirs make recycling and waste reduction and other ‘green’ things happen on the ground. NYC has some awards programs for recycling champions in schools, and exemplary building managers and superintendents. But no gold medals are given out yet for folks like Rick who volunteer in their buildings to nudge fellow residents to recycle and to take other steps towards zero waste. Until that day, it’s up to us to thank them for their efforts privately and publicly, and to lobby to make such recognition happen. Start now. Know of Another Exemplary Recycling Champion like Rick? Please share their story with others by sending an email to info@wehatetowaste.com. Or, simply drop a note in the Comments below. Tommy Sheridan is an expert on environmental science and sustainable urban design, as well as a relentless optimist! Tommy is a recent NYU graduate and currently works at the Marron Institute of Urban Management at NYU, where he works with cities to improve health, safety, environmental quality, mobility, and inclusiveness. He loves to travel, explore cities on his bike, and simply observe, preserve, and appreciate the world around us! Its people like this that truly make a difference … thanks for shedding some light on him! Just goes to show that effective change happens locally. Also, love that WeHateToWaste is asking to hear about other recycling champions! As a Schwab House shareholder who has known about Rick and his environmental committee for some time now I can only say that not only is his work much appreciated and respected. Reaction from and participation by our cooperators reflects the acceptance of his work as well. Fantastic to hear about this kind of initiative, and based on David’s comment, I’m glad Rick’s efforts are not going unnoticed. I particularly liked Rick’s advice on getting the co-op board approval (which is always tough) by recruiting a group of volunteers and keeping the overall cost down. Hearing about how Rick’s efforts make for a better place to live, and makes me want to get involved in the recycling process in my own apartment building! It’s refreshing to see someone who is not only passionate about environmental issues but is willing to put his money where his mouth is and act. It takes a special type of person to wake up everyday, repeating the mantra that “giving back and paying forward are a responsibility that I have not only today, but for future generations to come”. And he’s clearly effective in getting others to join him. I believe that one of the greatest yet surmountable challenges to creating a sustainable present is communication. But Rick has mastered this art through directed community outreach efforts that make the issues more accessible and interior communication strategies sensitive to individual audiences. In combination with his stick-to-it-iveness, drive, and dedication, it seems Rick has found quite the sustainable solution. I look forward to hearing about what’s next for Rick and the Schwab House! Wow – go Rick! Just last weekend I was visiting a friend and her apartment building AND downtown area were absent of any recycling bins or pickup, so I literally brought a paper bag of all my recycling from my stay to the airport to recycle it there. It’s crazy to me that so many places still lack recycling infrastructure and knowledge. I’m going to send this article to my friend and suggest she start something like this in her building now..! 🙂 Rick is truly an inspiration and the kind of hero we need these days.